These durable, waterproof, reinforced Crawlspace Vapor Barriers are a great value! Their multilayer polyethylene construction with extrusion lamination and reinforced layer of polyester scrim gives them superior strength and durability over typical hardware store vapor barrier options. Polyester scrim layer placed between low density polyethylene layers provides superior tear resistance and increases service life. Christmas Tree Ratchet Fasteners for fastening liner/film to foundation walls, available in 100ct or 500 ct bags. Calculate the perimeter Length of the entire space by adding length + width together and then multiplying by 2. (length + width) x 2. Note: Most crawlspaces are less than 4' tall so using a 4' or 6' wide vapor barrier for the walls will keep the seams to a minimum. Christmas Tree Fasteners: Christmas tree fasteners are made of heavy duty nylon and are used to attach the vapor barrier to the foundation wall. The fasteners have a flat white head and a conical tip which gives them a clean, unobtrusive look after installation. In order to carry the weight of the vapor barrier on the foundation, Christmas Tree Fasteners should be installed every 18" - 24". Fasteners are 5/16" diameter x 1-1/8" long and are inserted into a 5/16" hole (a hammer drill work best). Sold in bags of 100 and 500 pieces. Can I purchase half roll or custom cut ? I need about 150-200 sq. ft. of a 12 mil. or higher barrier. Do you cut custom lengths or have any pieces left over for purchase?? Let me know, I'd be interested to buy it. thanks. Need to place this on dirt ground for underneath a porch. What do you recommend to fasten with? And assuming I should use 12 mil since it's covering dirt. Can the vapor barriers be attached to Insulated Concrete Form (ICF) walls? How are they attached? My ICF contractor says that pins/screws should not be used. Hi. I'm wondering what special knowledge is needed to install this insulation properly. There are not many companies providing crawl space insulation (only one that I know of at all), so their prices are off the chart because there's no competition. I'd like buy the insulation and have a professional install it for a fair price. Can you recommend a trade that does this kind of work? Is a 12 mil sufficient for a slab foundation? Thank you. We would be covering rock that was put in crawl space but was not washed and is so dusty was wondering if put this over it could you walk on it and store stuff down there or would it get holes in it. 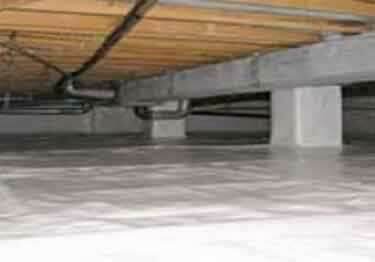 or is there something else to us its a very dry crawl space so no moisture problem. This should cure the musty basement smell as recommended by a Building Inspector. Will still need to purchase a dehumidifier yet but expecting to correct issues caused by a partial dirt floor in the basement.